I've mostly discussed cycling in this blog, but I thought I'd turn my attention to walking, starting with a look at central Oxford, roughly defined as the region frequented by tourists. I begin with a survey of the major problems and then offer some suggestions for improvement. 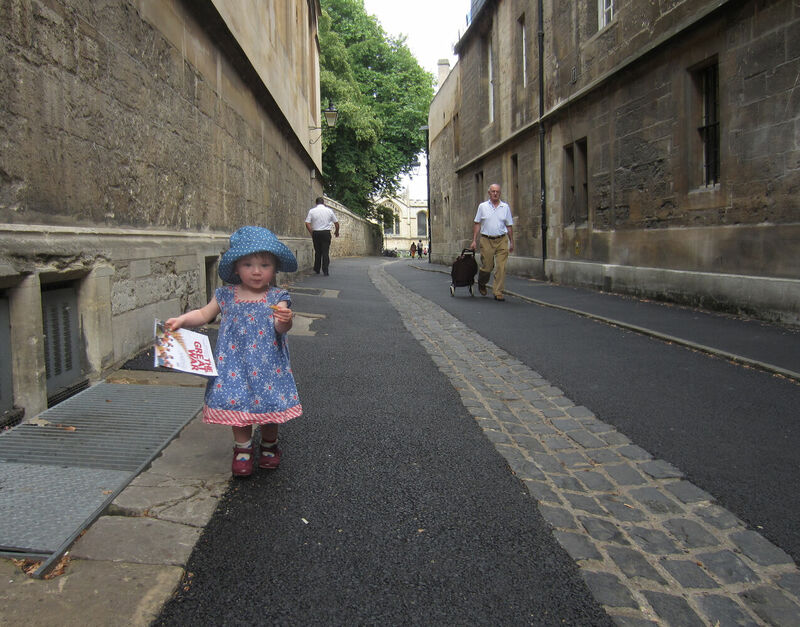 Most of my experience walking around Oxford is as a fit adult, but I have had experience both pushing a stroller and managing a mobile toddler. Try to keep in mind, while reading this, the dilemmas faced by people in wheelchairs, pushing double strollers, carrying several pieces of luggage, using crutches or a walker, or otherwise mobility impaired. It is also worth remembering that lack of familiarity with routes and risks will make negotiating the city significantly harder and more stressful for tourists and other visitors than for residents. Central Oxford may be better for pedestrians than many UK cities, but that doesn't mean it doesn't have major problems. It is clearly less pleasant to walk around than central Cambridge or Bath, let alone cities such as Prague or Venice. Being pedestrian-friendly is more important for Oxford than for most British cities. Oxford attracts a large number of tourists and visitors, domestic and international, who are important for the local economy, and how pleasant they find the city centre to walk around will have a significant effect on how much they enjoy themselves — and thus on repeat visits, word of mouth, and so forth. Ordinary residents may not get much choice (though I'm told some catch the train to Bath to go shopping), but tourists do get a choice: there will be people for whom Prague, or at least Cambridge, are alternative destinations. Keep in mind that this is not just about getting from one place to another. Walking around is not just a transport mode but a goal in itself. Central Oxford has immense value as a place, not just as a transit corridor. So pedestrians should be at the top of the "modal hierarchy" for transport, but they need recognition above and beyond that. On the one hand, there is very little in the way of fully pedestrianised space, almost nowhere one can relax if accompanied by a mobile toddler. In this category Oxford really only has Cornmarket and Gloucester Green. There are plenty of relatively low-traffic areas, but they are, with a few exceptions, not designed or engineered in such a way as to prioritise foot traffic or make them pedestrian-friendly. A street such as New Inn Hall St has almost the right layout, but has too much residual motor traffic and too much space assigned to parking (especially with regular illegal parking/loading) for people walking to share comfortably with a major cycle through route. Queen's Lane or Catte St have the right amount of motor traffic — almost none — but are not presented as pedestrian spaces. On Oxford streets carrying motor vehicle traffic, the pavements are just too narrow: often impossibly narrow for the amount of foot-traffic attempting to negotiate them in peak times. And this holds even for streets from which private motor vehicles have been mostly excluded, such as High St and George St.
Take, for example, High St outside Magdalen College, or Longwall St. As it stands, the pavements here, even when not obstructed by parked vehicles or bicycles, are just too narrow. The result is that pedestrians do (and sometimes must) use the roadway, which is stressful, forces them to negotiate kerblines, and pushes them into risks from motor traffic or into conflict with people cycling who expect to have right-of-way on streets (and have similarly constrained space). There are pedestrian signals only on one arm of the Cornmarket/George St/Magdalen St East/Magdalen St West/Broad St junction, and the timing on that is unfriendly to pedestrians. They are forced to judge when it is safe to cross, in the face of intermittent but sometimes high densities of buses and bicycles. A huge number of people move through this junction; pretty much all trips across town involve this or the almost as unpleasant Carfax at the other end of Cornmarket. The traffic lights at the intersection of Holywell/Broad/Parks/Catte Streets never give pedestrians any signal, effectively using them to calm traffic. This is not so bad for residents who at least know how they work, but is clearly disorientating for many visitors. The Holywell/Broad/Parks/Catte now has no signals at all. This is an improvement, but still fails to give pedestrians clear priority. In other places there are no crossings at all. Someone attempting to get across St Giles, say from the Lamb and Flag Passage to the Eagle and Child, has the choice between a long detour north or south or attempting to negotiate, without any guidance, an obstacle course full of parked and parking cars, dense and often speeding traffic, and cycle lanes that are poorly marked and too close to parked cars (almost invisible to pedestrians on some approaches). Irregular paving and broken surfaces elsewhere in central Oxford are an additional hazard to pedestrians. I'd never been worried about this myself, as an able adult with experience hiking off-track, but as a toddler my daughter landed on her face a few times after tripping, and one of my colleagues has had some nasty accidents. There may be some justification for the cobblestones in Radcliffe Square and elsewhere, but the street surfaces elsewhere offer unnecessary hazards to those crossing the roads or pushed off the pavement by overcrowding. There are potholes waiting to be fixed, sunken manhole covers, large hollows where buses have damaged the road, and depressions which fill when it rains, enabling buses and taxis to spray the pavements with muddy water. Perhaps the most dangerous conflict with buses involves them actually swinging over the pavement, for example with sharp turns at Carfax and the northern end of Cornmarket. Another obvious conflict is with bus stops and people queueing at them, most notably on St Aldates, George St, and Magdalen St West, but also on High St and a number of other locations. And there are problems with waiting local buses (Magdalen St East) and parked/waiting coaches (St Giles). The marking of cycle routes is often poor or non-existent. For example, a major north-south cycle route runs from St Ebbes across Queen St to New Inn Hall St, but this is completely unmarked, not giving pedestrians on Queen St any warning to expect people cycling at right angles across their path. Frideswide Square allows people to cycle anywhere on the pavements, not giving them or pedestrians any guidance at all. Elsewhere, cycle lanes through pedestrian areas can be green, in brick, marked with scattered bicycle symbols, or simply bordered by white lines. Especially for visitors to Oxford, this is often confusing. Even when there are separate footpaths and cycle lanes, the narrowness of both makes the separation nugatory. People on foot step onto the cycle lanes because the footpaths are too narrow, while people cycling stay right on the kerb (dangerously for them as well as pedestrians) because they have cars and buses passing them too closely on the other side. Pedestrians complain about people cycling, and people cycling about pedestrians, but in the majority of cases I believe this is a result of streets being engineered and laid out for motor traffic. Perhaps the most obvious examples are in areas such as New Inn Hall St, Broad St, St Ebbes, Turl and Catte Sts, though as a cyclist I find the stretch outside Magdalen College the most worrying. The pavements here only comfortably fit two people passing each other, which leaves no room for double strollers, people walking next to one another, wheelchairs, people with luggage and so forth, not to mention the occasional parked bike, or even a car or coach. So, given how little motor vehicle traffic there is (at least in Broad St, Turl St, etc. ), pedestrians inevitably spill onto the carriageway, and once they are there there is no separation from bicycles. It would be better for cyclists if more space were assigned to pedestrians, because it would be easier for them to stay out of the remaining carriageway or bicycle path. See below. Cycle parking can also be a problem, but using railings or walls for overflow parking is actually more efficient in space utilisation and less obtrusive than specialised bike parking would be. Footpaths need to be wide enough to accommodate it without forcing pedestrians onto the carriageway, however! Exacerbating the problems faced by pedestrians, the public transport system doesn't really offer many options for getting around inside the city centre. The bus stops are far apart and the bus services are geared to moving people in or out of the centre. Imagine someone trying to get from (say) the Museum of Natural History to Christ Church college. This is only a fourteen minute walk, according to Google Maps, but one which people with limited mobility might still find daunting. There are no useful public transport options here at all. And other examples are easy to find. I start with the easier suggestions. Take Queen's Lane and Catte St as examples, but this could apply to all the lanes south of High St and Queen St: Pembroke St, Blue Boar St, Merton St, Ship St, and so forth. A first step here would be to signpost these areas so as to make it clear the space is primarily for pedestrians and people cycling. More expensive would be to resurface and re-engineer these areas to make that status obvious: removing kerblines and vestigial footpaths and resurfacing so as to make the space unlike a road. Where these streets carry significant amounts of bicycle traffic (e.g. Catte and Turl Sts, New Inn Hall St), the carriageway should be replaced by a wide two-way cycle path to reduce pedestrian-cycle conflicts. This would be bounded by a clear but shallow kerb so people walking and cycling can share each other's space if necessary (to cross the road, get onto the cycle path, and so forth) but would have clearly demarcated spaces. A concomitant to this is that there will be no assigned space for motor vehicles at all, and they will be occasional guests who will have to move carefully. The speed limit should be dropped to 10mph (very short distances are involved, so this won't impose any significant delay on anyone) and local access only allowed, with time-restricted loading (along with date-restricted access for arriving/departing undergraduates as appropriate). There's almost no parking in these areas anyway, so they could be made into restricted parking zones, which would also allow removal of unsightly double yellow lines and some signs. Signing on the edges of these zones should make it clear that there simply isn't any parking available: as a tourist many years ago, I remember driving down some of these lanes, looking for parking (which is not actually ruled out by a no through road sign). Rather than doing it piecemeal, making the entire city centre a controlled parking zone would seem more straightforward. An intersection like Broad/Parks/Holywell/Catte, with low volumes of traffic, should be reversed from its current state: instead of traffic being given guidance and pedestrians left to fend for themselves, the area should be marked as pedestrian priority, the traffic lights removed, and stop lines marked on all the approaches. This could be augmented with some kind of raised table to make the pedestrian priority even clearer, and to make it natural for drivers of motor vehicles to slow down and look out. The higher volume intersections are harder. If the taxis could be removed from the northern end of Cornmarket (perhaps with the Gloucester Green taxi rank moved and accessed from Beaumont St), it could be left as a pedestrian/cyclist shared green most of the time, with a bus green enabled "on demand". And something similar might work at Carfax. The speed limit going through these junctions and the surrounding streets could be reduced to 5mph, as on Queen St. The through-route junctions at Beaumont/St Giles, Worcester/Hythe Bridge/George St, Longwall/High and so forth are harder still. With the first more space could be assigned to pedestrians and the space engineered for lower speed motor traffic, and taking some space from the car park would allow some changes at the second, but the third is obviously space constrained. Further loading restrictions would have an adverse effect on some businesses, but it would in most cases be a marginal increase in costs, not an existential threat. (It is also likely that for some retailers this would be offset by greater footfall from improved pedestrian access, and in the longer term from greater tourist numbers.) Most Oxford businesses involving heavy goods are already in retail parks closer to the ring road, and if the Argos store on New Inn Hall St had to relocate that would not be the end of the world. If anything, more space should be assigned for delivery vehicles, so they don't need to pull up in the middle of the road or park on pavements or cycle lanes. This could be done at the expensive of ordinary car parking, perhaps on a timed basis — so spaces might be loading access during loading times but disabled parking at other times. All cycle lanes and paths should be clearly and consistently marked, across Oxford. (Across the entire country, actually, but here as in so many areas Westminster abdicates what should clearly be a national responsibility and dumps it on local authorities.) And this should override any fancy ideas architectural and design firms might have (as at Frideswide Square). Provision of better and more bicycle parking would be a good idea, but pavements should also be widened so that bicycle parking on railings and against walls doesn't create obstacles for pedestrians. In some places there are serious space constraints (Longwall St) but in others there is plenty of space, just with vastly disproportionate amounts devoted to motor traffic and motor vehicle parking. The most obvious candidates for large-scale pedestrianisation are St Giles and Broad St — the latter is I think the easier and more obvious candidate. Given expected population and employment growth, more people rather than fewer are going to be travelling to and through the city centre in twenty years, and the current transport mix simply will not scale. There will also be more people walking around central Oxford. Maintaining, let alone improving, transport speed and convenience and pedestrian comfort and access is going to require something radical: more than just restricting parking, adding a few cycle lanes, and fiddling with signalling, or even moving kerblines and changing surfaces. Closing Longwall St to private motor traffic would improve the situation near Magdalen College and allow the Science area of the University to be made much more pedestrian-friendly. Closing Worcester St would allow reconfiguration of St Giles as a public space as well as civilizing Beaumont St. And there would be a big effect outside the city centre, in reducing traffic on radial routes into the centre such as Cowley and Botley Roads, which would make buses faster and more reliable. Which would result in a big increase in the number of buses coming into the city centre. As the situation at either end of Cornmarket shows, even without private cars a high enough density of buses and taxis can make for an unpleasant pedestrian experience. (Getting rid of taxis except for disabled passengers would help a bit.) And shifting modal share away from cars is going to mean even more people on public transport. Ultimately I believe it is impossible for much of central Oxford to be a pleasant place to be in while such large numbers of big buses are routed through it. But is allocating more space to pedestrians on what are going to be even busier bus routes possible? I write about this in a different post. Update: Pembroke St has been done up, but could have been much better for pedestrians. Very comprehensive. I'm glad you include wheelchairs, walkers and crutches. Don't forget walking sticks. Hope you pass your research on to the Pedestrian Association. With most of your arguments and suggestions I agree, but (a) the disabled parking spaces in New Inn Hall Street are a life-line for those who need them; and (b) Long Wall Street is at present the only practicable way for private motor traffic to get to the north (and thence to the west) from anywhere east of Merton Street/Queen's Lane, short of a pilgrimage through Marston and back down Banbury Road. My suggestion is to remove all the non-disabled parking but to keep disabled parking and loading areas - possibly even expand them. I'm not sure about New Inn Hall St in particular, though, as it's not ideal for motor vehicle access for a number of reasons (including the problems turning around to get out). Getting from East Oxford to North Oxford will be less convenient for cars if Long Wall St is closed, but it's not impossibly far out of the way to use Marston Ferry Rd (or Donnington Bridge Rd to get to West Oxford). So I think this is going to happen sooner or later. Closing Worcester St is going to be much harder, as the alternative route from North Oxford to (say) the railway station via the A34 is much longer. (Though the existence of Oxford Parkway may make this less of a problem.) Something has to give in the transport mix in central Oxford - imagine the current situation but "scaled up", with 20% more cars, buses, pedestrians and cyclists - and that has to be the least space-efficient mode, namely private motor vehicles. Think about reopening Cornmarket to buses only. Close Hythe Bridge Street to all but people on foot and bikes and deliveries to businesses there. Narrow motor carriageway in St Giles to make room for people on foot and bikes. If Cornmarket were one-way for buses, like Queen St, it might be tolerable, but two-way buses would kill it as a pedestrian space. I've vaguely thought a one-way, 5mph, bus-only loop running Queen St/Cornmarket/George St/New Rd might be feasible, especially if the inter-city buses could be shifted to a better location than Gloucester Green. Definitely St Giles should have the carriageway narrowed and more space assigned to cycling and walking. And if the parking were removed, the bus station could be relocated there (at least for the intercity buses, that's still not well placed to serve East or South Oxford). And yes, route all motor vehicle traffic via Park End St and give Hythe Bridge St to people! I'm a fellow Aussie that lives in Oxfordshire and I couldn't agree more with some of your points. I actually run a free walking tour from Broad Street most days. One of my biggest challenges for people unfamiliar with the city is the risk of them getting hit by a bike. This could be easily cured by further pedestrianisation and clear delineation between cycle routes and pathways. Don't even get me started on Turl Street!